By now you have probably read about the attacks on a satirical newspaper in France, Charlie Hebdo. I am not sure we have an equivalent here but they specialized in mocking political parties, religions, powerful people or any other entity about which they took a notion. But by this act and many others our enemies have shown us what they fear most. They fear being mocked and they fear that all of the evil they have committed in the name of their prophet is not really justified. They do not want to see this pointed out since it would make it harder for them to recruit and harder for them to keep committing the atrocities their religion requires of them. And that is why the best thing we can do for those trapped in Islam is to mock it. Islam NEEDS mocking. If it is ever to reform and become compatible with civilization it must be shamed into it. And that is why it is so maddening that our putative “leaders” in the west fail to do so. They fail to point out the vile acts of Mohammed and the vile things he required of his followers. Thus they ensure that the problem is never rectified out of some weirdly misplaced conflation of religion with race whereby they do not want to be seen as being racist. And by doing so they prove themselves exactly that… as if we cannot expect more from Arabs than what Islam expects of them… and as if Arabs are the only ones who can act in such ridiculous and reprehensible ways. The implication is that only little brown people practice that sort of Islam so any criticism of it can’t be separated from their race. This is how the people who populate our government and media think. Our politicians would not hesitate to criticize fascism, even those who practice it in one form or another. 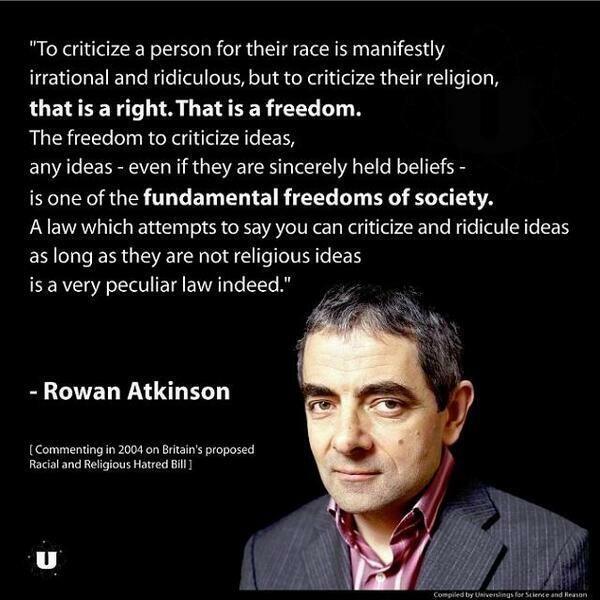 Yet they will not criticize a religion that is every bit as bad as a creed. We are lead by truly and deeply ignorant people. Luckily, our comedians, both at Charlie Hebdo and elsewhere are far brighter and far more principled than our politicians. I will also say this as someone who is not religious and doesn’t have an invisible man in the fight; not all religions are morally equal. I know that is shocking and you aren’t supposed to say it but it is nevertheless true. Our leaders have no problem pointing out where they think Christianity has gone awry from gay marriage to any number of other issues. But when it comes to telling people they might not want to run about lopping the heads off of homosexuals and others then they are amazingly silent. But they will not shut up about the religious implications of various means of birth control. On the left there is a feeling that all religions are the work of lunatics and that all prophets are insane. That feeling is not one I share but it is common amongst those who are not religious, but most common amongst those on the left. But even if it is true there is a difference between the criminally insane and the merely deluded. Mohammed committed enough vile acts that he would certainly be classified as mentally insane were he alive today. He would not be allowed to walk the streets of any civilized country. Jesus would not have that problem. In short, no society that would let Mohammed walk free could ever be considered civilized, while precisely the opposite is true of Jesus. No society that would imprison him could be considered civilized. You get rotten fruit from rotten seeds and the reason Islam has never been able to truly reform is that it would have to abandon the only thing that makes it different than all of the other religions… its prophet. Thus the day Islam reforms is the day it ceases to exist. These are the difficult things that everyone knows but no one wants to admit. But the radicals certainly understand it as they proved with their actions today. So we have to hope that at some point Islam transitions into something else entirely. They can make up some other version of Mohammed than the historical one. They can start anew and tell themselves whatever lies or rationalizations it takes but it must be done — and sooner rather than later. Any strategy for the war on Islamic terrorism which does not have this as its ultimate goal (whether publicly acknowledged or not) is a losing one.